I really enjoyed most of this book. It is chock full of some of the best similes I have ever read. If you do not know what a simile is you should upon finishing this book. Highly readable, funny and tragic, it did lose me in the end. I really enjoyed the prose style of this author. She writes with a lyrical, poetic style that resounds with allusions and literary references. As a psueo-memoir, it was relevant and quirky enough to keep me reading. A wonderful read. Ms. Pritchard really knows how to make the ordinary, extraordinary! This was a fun romp through the life of a lady, with lots of laughter, sadness and everything in between! Kept my head spinning, I loved Ruby. . I bought this book after hearing the author's reading at a salon for the Wilkes University MA/MFA in Creative Writing residency in June, 2016. Sara Pritchard's alternatively sweet and snarky, high-pitched delivery completely disarmed me as she read an anecdote about a date who took her surfing only to find that she was terrified of water and could not swim.Crackpots, a novel which I can only assume is based on the author's experiences, is similarly filled with vivid, off-beat characters. The protagonist is Ruby, whom we meet as a small child in red cowboy boots and hat and holsters. Her father is a demolitions expert and her mother is a piano teacher, and snatches of music from those days and the grand piano itself anchor the dreamlike sequences and manic occurrences. Ruby's family is described by observers as a "bunch of crackpots," and as she makes her timid, vivid way through childhood,schooling, and three marriages, she remains childlike and impulsive, often retreating beneath beds, pianos, and tables. Her prose is witty and bright, with sudden detours into sensuality or fascinating details, before whisking away into self-destruction or escapism. It's a quirky piece of fiction, but it rings true. Lovely writing, a little unusual (always good) a little off kilter, breathtaking at times, achingly real. I look forward to more books from this author. LOVED the front cover, how could you not buy that book...Now that this book had me awake half the night thinking and processing it, I thought I'd add: I love how many "writing rules" she broke writing this book. She would not receive a "good" grade from most professors but then there is that question, "can you teach writing? "The stories are hilariously real to cutting to the bone real.She changes POV (which I like to do in a story but in a writing class it gets your knuckles injured.) I don't mind a change of POV once in a while, as long as it's a new chapter, I'm smart enough to figure out who's speaking given a few clues. (If I wrote a story about myself, it would be interesting to have my mother say a few words. )This book is truely haunting, it's made up of flashes of light, moments in time. It doesn't go into great detail, we are left to "get the picture" more than once. It just proves a book doesn't have to go on for 700 pages to get to a point and I love brevity in writing, especially good writing. Thanks for a great book. Objectively speaking, this was a very well-written novel. Sensitive. Insightful. Eloquent. Still, though I found Ruby Reese to be a very fascinating and likable character, I got a little depressed endlessly wallowing in the melancholy details of her life, what with the string of doomed romantic relationships and personal losses. ..but that's just me. What IS cool is the way she presents the story as if looking down on a time-line of her life, and the time-line is a jigsaw puzzle that is being put together piece by piece in beautifully disjointed fashion, leaving the reader with a view of time that's less a vast ocean, more an intricate web. Somewhat similar in this regard to 'The Time-Traveler's Wife'...perhaps if it had been written by Sylvia Plath. Winner of the 2002 Bakeless Prize for fiction. ..whatever that is. I gave Crackpots three stars, not because I didn't like it, but because it was a book I really had to think about. It wasn't the good quick summer read I was hoping for, but it was still a good book, none-the-less.It jumps from different time periods making it slightly hard for me to keep straight. It was a book full of inside jokes and weird animals I wasn't quite getting into (I attributed it to the parts of West Virginia I didn't get to know in the four years I was there). An amazing book that uses a non-linear storyline to tell the story of a family of wonderful, zany characters. Sad and heartwrenching and often hysterically funny, Sara Pritchard is a writer to be experienced and admired. And not to be missed is her delightful use of the family's dogs as real characters in the book's plotline. Very strange story. Kept jumping around in time, from childhood to present to early adult; confusing. Crazy family, with main character being craziest. Was interested in location of story: central Pennsylvania and West Virginia, so some locations were familiar to me.Don't know that I wuld recommend to anyone. Was winner of Bakeless Prize at the Breadloaf Writiers Conference???????? I really love Sara Pritchard - both the author and the lovely, lovely person I've gotten to know as a part of West Virginia University's M.F.A. program. This book is a delight - not just Ruby, but every character, is marvelously well drawn. Great stuff! What a fantastic adventure! This book will hook your interest immediately and keep you fully engorged in a world of colorful characters and vivid imagery. I can't wait to read more from this author! A little less spunky than the publisher's blurb implies, and a little more tragic-comic. Recommended read for the stellar writing and exquisite imagery. Loved loved loved the story of Ruby's painful visit to the Swedish aunt and her TV-watching dog, Igor. I can't remember whether I read a review of this, or if it was a "library shelf proximity find." A quirky read -- that's really all I remember. A great read, a novel that reads like a memoir. My favorite image. The insominac mother who walks the neighborhood streets playing her violin. Sara Pritchard Melissa Lotfy - Along with Help Wanted: Female (Etruscan Press, 2013), Sara Pritchard is the author of the novel-in-stories, Crackpots, and the linked-story collection, Lately. 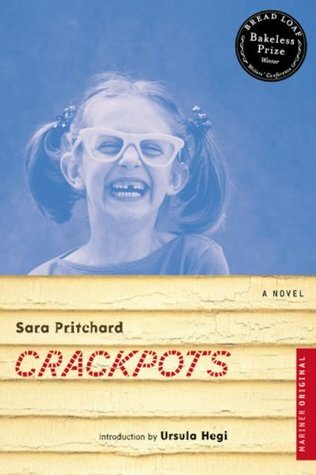 Pritchard won the Bakeless Prize for Fiction in 2003 with Crackpots, which went on to be a New York Times Notable Book of the Year. She lives in Morgantown, West Virginia, and teaches in the Wilkes Low-Residency Creative Writing Program in Wilkes-Barre, Pennsylvania.